Holiday Inn Galveston gives visitors the choice to stay in any of the three Galveston Texas hotels along the seawall. There are three Holiday Inn hotels on the Galveston seawall. One is on the far west of the beach, the other two are on the east side of the beach. Holiday Inn Express Hotel & Suites is on the west side of the seawall. It's a four floor facility with 81 rooms much smaller than the other hotels. It is in a sparsely populated area and about 70 meters to the beach. It is a perfect place for easy strolling along the seawall. The hotel has modern amenities including an outdoor pool to make vacations enjoyable. This Holiday Inn Galveston hotel promotes a free breakfast bar. The nearest eating places are the Sonic Drive in and McDonalds which are about 7 minutes drive from the hotel. Sight seeing places like the Moody gardens are not far away. Hotel Amenities•	Data port•	Family Rooms •	Parking•	Fitness center•	Free breakfast•	Meeting rooms•	Non-smoking rooms•	Room service•	Business center•	Swimming pool•	Wheelchair accessible•	complimentary wireless Internet access•	cable television and cable/satellite TV•	refrigerators microwaves•	coffee/tea makers. 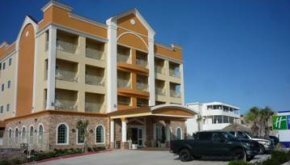 The other Holiday Inn Galveston resort is about 2 miles from the Express Hotel & Suites. It is an 8 floor 179 bedroom hotel facing the gulf. Visitors have a great view of the gulf. Rooms in the Holiday Inn hotel can be very competitive around summer time because of its location. This is an area with a lot of activities. Visitors do not have to go far to visit major restaurants. The nearest restaurants are Rainforest Café and Landrys. Steak house and Beach Café are just a few minutes away. Breakfast, lunch and dinner are served at the hotels’ Jetty Restaurant. Expect bumper to bumper traffic on seawall during summer and expect a lot of people strolling. This picture was taken in winter time (December) so it does not look that crowded on the seawall street. The beach in front of the Holiday Inn Galveston hotel is busy summer time but it gets busier towards the east end of the seawall. This is the right place for those who love to be among a cluster of hotels and tourist friends. The Sunspree Resort is also about 2 miles east from the Holiday inn resort. This location is much closer to the popular Stewart Beach and the Galveston Island Ferry. The resort is about 450 meters from the beach with rooms facing the sea. This is another high demand beachfront hotel along the seawall. This is one of the busiest area during summer time. Tourists can walk to the Stewart beach from the Sunspree hotel. Holiday Inn Galveston Sunspree resort has a nice outdoor pool. The Kokomo's Bar and Grill in the hotel serves breakfast, lunch and dinner. Captain Jack's Beach Bar is just in front of the hotel near the pool. Millers Landry, Salt grass and Dennys restaurants are within a walking distance. This photo taken in December shows the hotel from the beach and the seawall. 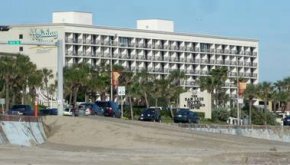 The three Holiday Inn Galveston hotels present vacationers who like to travel to Galveston, the choice of picking the kind of environment they like for holidays.